Changes in the environment can initially affect the survival rate of pathogens and pests. 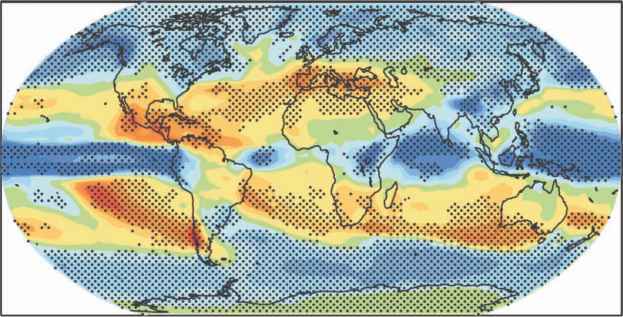 Higher minimum temperatures and reduced frequency or intensity of cold days favour the survival of pests with the falling temperatures (Coakley et al., 1999). Leaf rust epidemics caused by Puccinia triticina in wheat in Kansas, USA were found to cause higher yield losses over nearly two decades in areas where the pathogen could overwinter (Eversmeyer and Kramer, 2000). Likewise, if the frost line moves north in the northern hemisphere, higher average winter temperatures could be associated with higher survival rates of insect pests. Since mild winters and warm springs contribute to the survival and early development of aphid vectors, they will favour barley yellow dwarf (BYD) disease, one of the most severe viral diseases in autumn-sown cereals in Western Europe, transmitted by three aphid species (Rhopalosiphum padi, Sitobion avenae and Metopolophium dirhodum). However, hot dry summers increase aphid mortality and could halt the progress of the disease (Fabre et al, 2005; Chancellor and Kubiriba, 2006).